Rio Grande City High School promotes safety during Spring Break. "Each year the RGCHS coordinates a Safe Spring Break Project with the help of several community leaders," said Mrs. Jessica Vera-Rios, Counselor. Mr. Juan Ocha has volunteered Ochoa's Wrecker Service to provide the crashed cars demonstration on the school front lawn for the past 5 years. This year Mr. Ochoa was recognized with a Certificate of Appreciation for his continued support and volunteer work towards helping the youth at RGCHS over the years! He was presented with a gift bag and framed certificate from Mrs.Vera-Rios. 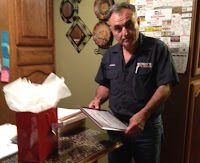 On behalf of Mr. Adolfo Pena, staff, and students, we sincerely thank Mr. Ochoa for his generosity and civil service."